JAKARTA (Reuters) - Southeast Asia's biggest economy this month is winding up one of world's most successful tax amnesties, with at least 745,000 taxpayers declaring more than $330 billion of assets so far. President Joko Widodo has cited higher tax revenue as the key to boosting infrastructure spending and growth. 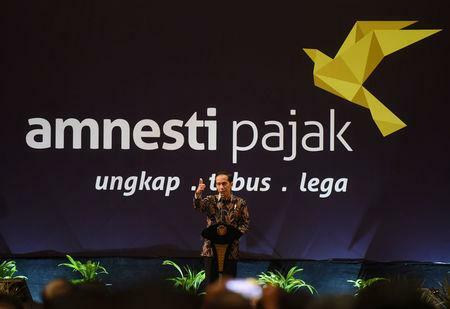 But if the amnesty is to avoid being just a one-off windfall, Indonesia needs to improve a tax collection ratio well below many of its peers, international agencies and local officials have said. To that end, Indonesia's finance minister Sri Mulyani Indrawati has set up a special tax reform team to boost collection. It faces an immense task in a country where tens of millions of people - both the wealthy and the poor - remain outside the tax system. "People don't pay taxes because they believe they won't get caught," said Darussalam (like many Indonesians, he goes by one name), a partner at consultancy Danny Darussalam Tax Centre. The amnesty has provided the government with more revenue than similar plans in countries such as India, Chile, Italy or South Africa, Indrawati said. The tax bureau as of 2016 employed about 38,000 people to collect taxes from a workforce of 118.41 million. Less than a third of the workforce is registered at the tax office and even fewer file annual tax reports. A visit to the tax office in Jakarta provides a window into the challenges the government faces. He has 661 taxpayers under his watch, but focuses on the biggest 100 companies that contribute the most to his target of collecting 495 billion rupiah ($37.02 million) this year. "We are the spearhead of state revenue collection," said Martino, at his temporary office with a misfiring air conditioner. 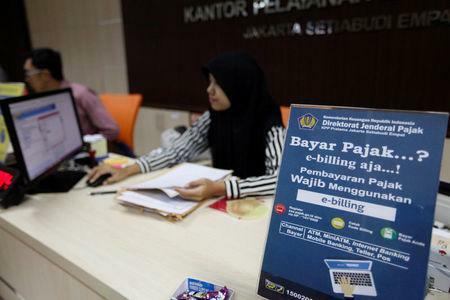 The draft in Indonesia's parliament calls for giving tax collectors wider access to bank data in line with Indonesia's pledge to join a global effort to share tax-related financial data. Andreas Eddy Susetyo, a member of the commission overseeing the bill, said it may take up to a year to finish discussions and even then progress may be interrupted because politicians would be distracted by campaigning ahead of 2019 elections. Widodo has vowed to bypass parliament if necessary by issuing an emergency regulation before mid-year giving the tax office access to bank data. In the meantime, Finance Minister Indrawati's tax reform team aims to increase the tax ratio to 15 percent of GDP in 2020 from about 11 percent now. That compares with a global average of 14.8 percent in 2014, according to the World Bank. The team, consisting of finance ministry officials and advisers from the World Bank and other agencies, intends to act as a brainstorming think-tank to push through reforms of everything from the tax office's business model to tariffs. Hestu Yoga Saksama, a tax office spokesman, said the team would redeploy thousands of tax officers to auditing once the amnesty period ends this month. "We are preparing to take legal action against people we found non-compliant but have not taken part in the amnesty," said Saksama, describing it as a potential quick win. But the World Bank still estimates Indonesia will miss its 2017 total revenue target by 70 trillion rupiah ($5.23 billion), while the tax ratio will likely stay below 11 percent of GDP. Rosan Roslani, chairman of Indonesia's chamber of commerce and industry, said that the tax office should not just monitor those already in the system, but go after tax evaders. "When our tax base is low, there will be some 'hunting in the zoo' because you only have so many people in the system," said Roeslani, who is also advising the reform team. He advocates creating an Indonesian social security number system, similar to that of the United States, to help boost the number of taxpayers.